Petunia Mafia welcomes riders of every type of bike and ability level. As such, we offer leader-appointed rides labeled as Green/Blue/Black. We borrowed the idea from ski resorts, who break down slopes into beginner/intermediate/advanced terrain. In cycling that translates to the skill and pace of the rider compounded by the cycling route. 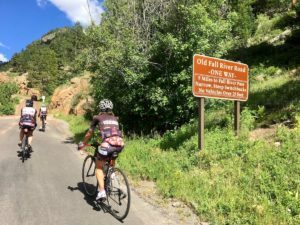 Where our “5 the hard way” ride consists of individual blue routes – NCAR, Flag, Sunshine, Lee Hill, Old Stage – the act of stacking them all together in one day makes it a black event. We do our best to help everyone understand what the color designations mean. Sometimes rides fall somewhere between levels. Because of this you may read or hear “turquoise” or “navy” in our description. Men would totally not get that. But we don’t want to discourage a lower level from trying something a little more challenging. It’s how we advance as athletes. Remember, intimidation has no place next to the likes of you. Don’t underestimate your ability. Memories aren’t made from the couch. To enjoy your experience at Petunia Mafia, have at least a solid year of cycling under your belt. Green rides are no-drop; there will be an official leader and most likely a sweeper. You can specify that you’re pulling off early if you want to head back on your own or prefer to not make others wait on you (we’ve all been there! ), but please do tell us so no one’s afraid you’re lost. 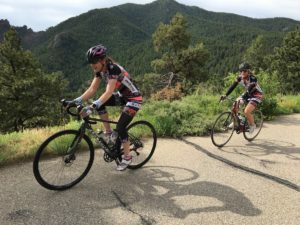 The team offers free and low-cost skills clinics, bike maintenance workshops, and talks by pros such as sports psychologists, trainers, coaches, nutritionists, etc. While we love you just the way you are, we’ll enable you become a better cyclist. It’s more fun, trust us. You don’t have to become a hard-core badass. However, you should show up with knowledge on how to fix your flat (go to aforementioned clinics) and have a bike in proper working condition (ditto). 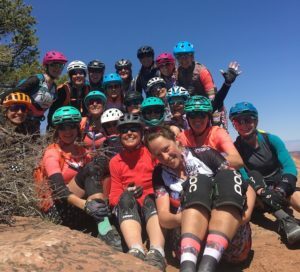 Roadies: you like a pace of about 10-14mph average on flat or rolling road rides, and/or are just beginning to get used to riding in a group. MTBer’s: the terrain this is slightly more technical than a hilly gravel ride but doesn’t include drops much bigger than a low curb. You may go on a blue ride and walk over the scary parts; no judgement from us. You’re learning how to corner, climb and descend. A 6-8 mile ride is ideal. You’ve identified as a cyclist for a while and are comfortable riding in groups. You like a workout when you ride and are game to push yourself on occasion. While the pack may re-group at crossroads or natural gathering points, blues are officially drop rides. The goal isn’t to drop anyone, however the possibility exists if you’re waaay off the back. 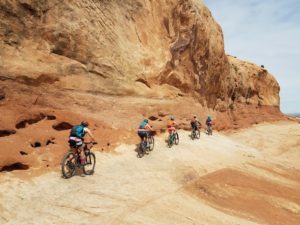 MTBers: you’re comfy on varied, somewhat technical singletrack. A 15 mile ride sounds great. You have decent bike handling skills on dirt, gravel, roots and small-to-medium rocks but may not be launching it yet. You know how to be prepared for mechanicals on the trail. You may walk sections that are more technical than 80% of the trail. 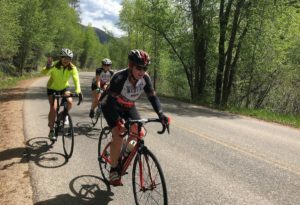 You’re pushing the pace, training for a race, want to get your heart rate up, have expert skills, and/or are an experienced cyclist. Black are drop rides. Roadies: You’re on a group ride and your instincts want to organize everyone into a pace line. Long mountain passes make you drool and 18% grade sections are a red badge of courage. You’re a past or present racer of crits, hill climbs, and/or TT’s. ‘Nuff said. 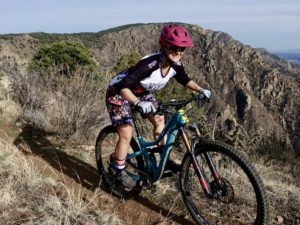 MTBers: You’re a past or present racer. You’re in a flow state while riding, and braking/cornering/shifting is intuitive. Advanced technical skills or strong endurance on difficult terrain can both land you in this category. Therefore you choose the ride based on the trail review, but chances are you’ve already ridden it.